Is a method of detecting sub-surface flaws by directing a high-frequency sound beam through the material at various angles. When the sound beam's path strikes an interruption in the material continuity, some of the sound is reflected back. The sound is collected by the instrument, amplified and displayed as a vertical trace on a screen - The response helps to determine location, size and type of flaw for example, cracks, lack of fusion, slag inclusions, porosity etc. MPI is a non-destructive testing (NDT) process for detecting surface discontinuities in ferro-magnetic materials. Finely divided magnetic particles, applied to the magnetized part, are attracted to and outline the pattern of any magnetic-leakage fields created by discontinuities. Surface flaws that are not visible to the naked eye can be detected by Dye penetrant inspection. It is widely used for detection of surface breaking flaws in nonferrous and non-porous materials such as aluminium and stainless steels. Penetrating liquid can be either colour contrast (visible) or fluorescent. 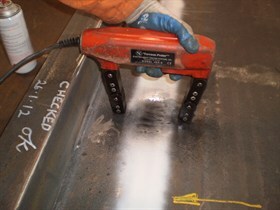 The penetrant is applied to the surface of the part to be examined. Capillary action draws the liquid into the surface openings, and the excess is then removed. A "developer" is used to draw the penetrant to the surface, and the resulting indication is viewed in natural or artificial light or ultraviolet (black) light. The high contrast makes it possible to detect minute traces of penetrant that indicate surface discontinuities. A quick and simple method of inspection and compliments all other disciplines within the field of NDT. The above methods may need to be utilized to confirm findings.